Poems, songs and inspired philosophers of all ages have often said that “love heals all”. Is this more than just a catchy phrase? The answer is yes. Hard science proves to us exactly how this thing we call love creates harmony and perfection. Some scientists have concluded that love is a frequency. Dr. Leonard Horowitz was one of the first to discover that the 528 hz frequency is central to the “musical mathematical matrix of creation.” He calls this the “Love frequency.” His underlying philosophy is that certain frequencies will have a stronger effect upon their environment than others, and there is research to prove it. 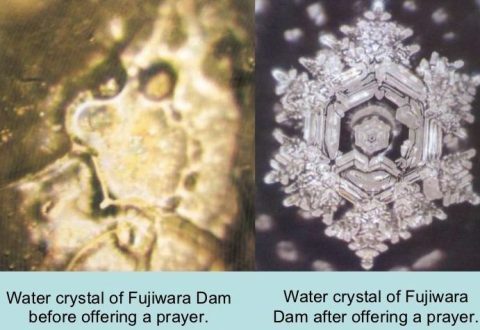 Dr. Matsuro Emoto, a Japanese scientist, used the love frequency in his experiments on water. He infused water with the vibration of 528 hz and then slowly froze it. As he photographed it with a dark field microscope, a water crystal expressed itself in a beautiful, symmetrical form. What does this say about love? Matsuro’s most famous experiment had to do with transforming the polluted water of Fujiwara Dam in Japan. The results were staggering. The deformed, polluted water had transformed into a beautiful six-sided hexagonal snowflake of health and purity you see on the right next to the ugly shape the water of this entire dam had just tone hour prior! The implications of these experiments are remarkable, as our bodies are at least 70% water! Therefore, what we think and say has a profound effect on our health and beauty. Both Emoto and Horowitz's studies reveal that health and symmetry go together. What we call healing can either be a return to a ‘place’ where all is well, or perhaps your first visit there. It is a place where you are in perfect health; where you are feeling great, and where the earth is allowed to be in its natural state of perfect harmony. Healing is a phenomenon where something that has gone out of balance, whether it be a relationship, a job, or your body, comes back into balance. Therefore, when we create the vibration of 528 hz, we are helping to support the natural blueprint of perfect harmony and health. A deviation from this mathematical structure results in a condition we consider to be a ‘deformity’ of nature -- something that is out of balance, or simply "off." We instinctively recognize these imbalances when they happen because we have an internal antenna that is attuned to seeing the perfect design, and tells us when there is a deviation in it. By exposing the polluted water to 528 hz frequencies, they reduced the contamination in a two-mile-wide area from a concentration of 7ppm (parts per million) to only 1 ppm within a 24-hour session. The water color also changed from a grotesque brown hue to a beautiful, clear green. As reported on the website https://attunedvibrations.com/528hz/, on the first day the polluted area was treated with the 528 hz and associated frequencies for a total of four hours. The waters had completely cleared by the next morning. Four more hours of RF frequency were then implemented to finalize the test. The device that generated these frequencies was situated about 25 feet up the beach from the shoreline. The water showed a remarkable restoration of biological life almost immediately, with fish, dolphins and even barnacles returning to the area. Dr. Robert Naman, President of Analytical Chemical Testing Laboratory, Inc. of Mobile, Alabama independently certified these results. Dr. Naman is an analytical chemist with almost 30 years in the field. After testing the samples, Dr. Naman confirmed that the oil and grease had been completely removed. This amazing discovery has profound implications for the modern plight of our planet! These scientifically verified experiments show that the frequency associated with love transmutes sick and diseased material back into healthy matter where life can flourish. So what can the frequency of love do for you? This proves that our thoughts and our words directly affect the structure and function of DNA. The health and vitality of our bodies, and our greater environment around us, is far more affected by the power of our collective consciousness than we may have ever realized. Therefore, it is an excellent idea to pursue genuine impeccability in our words, tonality and deeds. 1. Speak words of appreciation and love to yourself and others. This has a beneficial effect on health. 2. A positive tone of voice will create harmonious results for your physical and emotional body, and will uplift those around you. 3. Listen to music that has a 528 hz or 432 hz vibration, which is proven to be healing to the body. 4. Since the way that others speak to you has a direct effect on your health, choose people that speak to you positively.